I applied for a library card at the Galt Library when I registered for the Paper Craft class that was offered there recently. The only thing I've borrowed from the library was Andrea Bocelli CD and DVD combo called Under the Desert Sky. 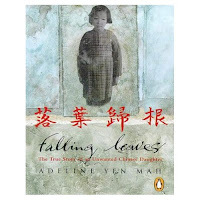 A few days ago I was recommended Adeline Yen Mah's book called Falling Leaves: The True Story of an Unwanted Chinese Daughter. I didn't want to buy another book since I've got a pile of books waiting to be read! I decided to check online if the local library carries the book. It does not. But I was able to place a request online and the library will get the book for me because there are other libraries that are under the Sacramento Library system that do carry the book. I will be notified by the library once the book becomes available at the local library. I think that it is neat that I am able to do all this online. At the Sacramento Library website, you can search for any book on their catalog. I don't know if you request for a book that they do not carry, they will order it for you. But what I do know now is that you can request for any book that is available even if your local library does not have it. The other thing is that you can return your books to any of the libraries that is in their system. You are not confined to one particular library. Nightwing, who recommended Adeline Mah's book to me, wonders when the libraries in Malaysia will be able to offer such a service. "Next century?" I teased. suba selalu aku ngagai library kuching but aku rasa iya bedau bisi ngena sistem online lah ( aku rasa jak lah) laban lama enda kala kia. One thing malaysia bedau ulih nitih sistem barat adalah laban mentaliti kitai malaysian agik mayuh ketinggalan.Misalnya CD,enti ulih borrow ba ditu,tentu CD nyak enda gayu(keh keh keh) and org pun mayuh gak ngadu cetak rompak ( includinglah aku laban kaki ngadu CD dirik empu..hehehe) Lagipun mayuh malaysian agik kurang membaca.Most prefer majalah hiburan especially youngsters. That is so neat..to request a library book online...mind you, it is just for loan and not buying the book. Good stuff to the library system there. Pat, CD, video tapes, enggau DVD endang ulih diinjau. Enti enda direturn, ahh, kena denda, and enti rusak, mesti diganti rega penuh! So enda tau sebarang. Enti denda enda dibayar, bisi lah org ari collections agency ngiga nuan, telipon rumah nuan sampai nuan mayar denda nuan .. berhati hati ga, enda tau sebarang nginjau utai. Nightwing, yes it is indeed neat! This is the first time I've ever obtained a library card since moving to this country. And you know what else? You can't find those cards on the books' pockets, the ones that the librarian keeps in their little cabinets under your name? Everything is computerized, When you checked out a book, you will get a receipt with the return date on it .. almost like a receipt that you get when you purchase something at the shop.